Next we will explain take-off of lighting controls. Since lighting controls must be quoted by your suppliers, they are among the first items that you take off. Take off lighting control panels, wall and ceiling occupancy sensors, relays, wall mounted dimmers, room controllers and accessories for the lighting control panels. All these items are often quoted along with the lighting package. When you are done with your material list of lighting controllers, send your list to your supplier with your lighting fixture count. 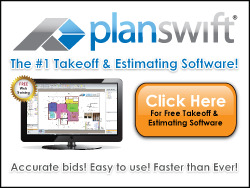 This allows your suppliers to work on your quotes while you are continuing your take-off.